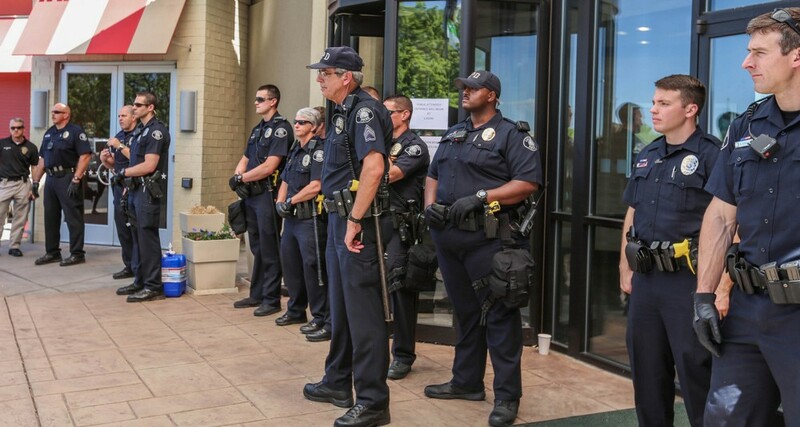 Police officers block the entrance to the Bureau of Land Management auction at the Holiday Inn of Lakewood, Colorado, May 12, 2016. In 2013, The Guardian revealed that the FBI had spied on activists organizing opposition to the Keystone XL pipeline. The agency “collated inside knowledge about forthcoming protests, documented the identities of individuals photographing oil-related infrastructure, scrutinized police intelligence and cultivated at least one informant.” The FBI later confirmed that the investigation violated its own guidelines. 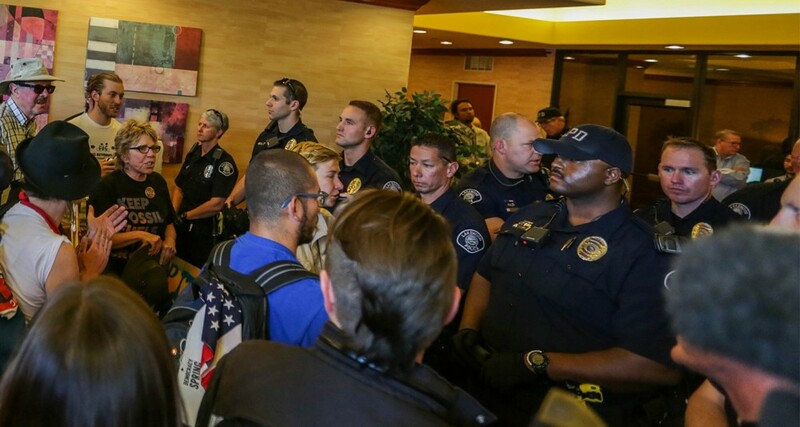 Protestors gather inside the Holiday Inn of Lakewood, Colorado to protest the auctioning of public lands for oil and gas companies, May 12, 2016. The focus on preventing the leasing of public lands for fracking gained national headlines in 2008 when activist Tim DeChristopher successfully bid on 22,000 acres of oil and gas land in Utah. DeChristopher, who served two years in prison, did not intend to pay but won the bid in order to disrupt the auction and call attention to the leasing program. That pricing regime allows private corporations to pay deeply discounted rates — as little as $1.50 per acre — for drilling rights. Congress has followed suit. On June 24, Rep. Alan Lowenthal, D-Calif., and Rep. Tom Graves, R-Mo., introduced Innovation in Offshore Leasing Act (H.R. 5577), which calls for online bidding for oil and gas contained in waters controlled by the federal government. On July 6, the U.S. House Subcommittee on Energy and Mineral Resources held a hearing on the bill and it has since passed out of the House Natural Resources Committee. While the oil and gas industry has come out in support of online bidding, and one contractor in particular named EnergyNet stands to profit from such an arrangement, several environmental groups issued a statement decrying the shift toward online bidding. EnergyNet, whose CEO testified at the June 24 congressional hearing, will oversee a September 20 BLM auction originally scheduled to unfold in Washington, D.C.